When I first moved out to Auburn to work on some HRV projects, I fully expected to jump right into some training study’s where we’d have team’s use an HRV app and start collecting data. I realized pretty quickly that these projects would probably have a hard time making it through the review process with a journal without validation of the field devices and the modified recording methodology that they utilize. Our first projects were therefore to cross-validate an HRV app that we could use with the athletes (link to study), assess the agreement between the ultra-short measurement duration typically used by app’s, and determine how long it took for an athlete to achieve a physiologically stable condition prior to recording HRV. In our latest project we recorded 5 minute ECG’s from 23 collegiate male athletes (from the Soccer and Basketball teams) at rest and following a maximal graded exercise test. 5 minutes has been established as the standard for short-term HRV assessment. However, for lnRMSSD (the value used by the smart phone app’s like ithlete and BioForce), there is evidence suggesting that ultra-short measures (60 seconds or less) may be sufficient. From the 5 minute ECG’s, we randomly selected 10, 30 and 60 second segments to compare to the 5 minute lnRMSSD values. Essentially, we found that 60 second measures showed near perfect agreement with the 5 minute measures both at rest and post-exercise. However, as might be suspected, as measurement duration decreased (to 30 and 10 seconds), the agreement with the 5 minute measures also decreased. The key points of the study are listed below. 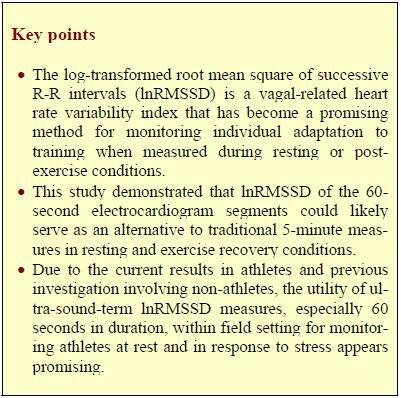 Our results make us quite confident that 60 seconds is sufficient for valid HRV assessment in athletes. The full text for this study is linked below. Our latest project, currently in the process of being submitted for review, assesses how long the pre-recording resting period needs to be for “stabilization” prior to an HRV recording. One of our primary goals is to determine the shortest valid recording methodology possible to enhance convenience of HRV monitoring in field settings. Next is to determine how this can be practically applied in the sports field for training management as there is very little longitudinal data from team sport settings reported in the literature. We hope that the shorter measurement protocols and validity of field tools will encourage more work in this area. This entry was posted in Heart Rate Variability, Monitoring and tagged heart rate variability, HRV, lnRMSSD, methodology. Bookmark the permalink. 4 Responses to Is a 60 second HRV measurement sufficient for valid assessment? Very valid for smart-phone app users. Looking forward to reading about what might be an adequate “rest” period prior to the HRV readings. I currently measure my resting heart rate and blood pressure prior to taking the HRV readings, so I have a 1 minute “rest”. Thanks, David. 1 min rest period is likely sufficient and has been used with elite endurance athletes in published research. For real time display to the coach we use 30 or 60 RR-interval SDSD as indicator of fatigue…. pretty good for ice-skaters. I would be interested to hear your conclusion. I have noticed inexplicable jumps in HRV of +/- 20+ and wonder of this is a factor. i have also been used to having a sip of water when I use the bathroom (and before the test).